What's this cheese cave doing in NYC? The United States currently has a massive cheese stockpile. And Uncle Sam is stepping in to help buy up the excess. The Department of Agriculture said on Tuesday that it will spend $20 million on 11 million pounds of cheese from private inventories and then give it to food banks and pantries across the U.S. 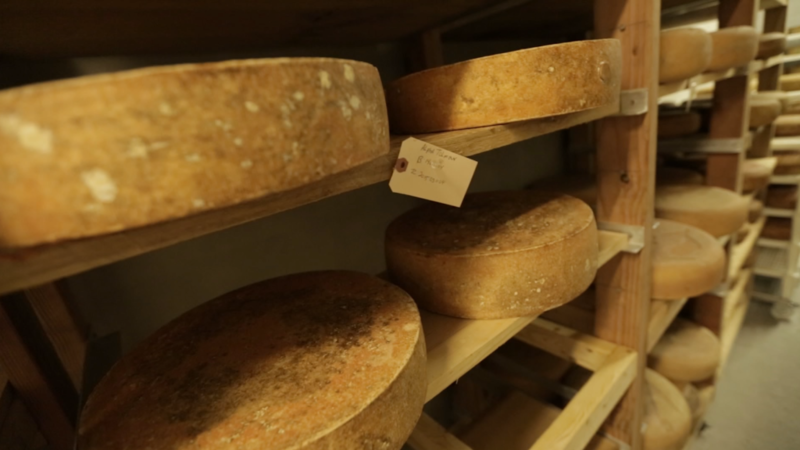 Increased milk inventories, higher European exports, low prices, sluggish demand and shifting consumption habits have helped to create the huge cheese reserve, pushing the surplus to a 30-year high. While that might sound like a dairy-filled dream, it's problematic for dairy farmers, who have seen their revenues drop 35% in the last two years. Congress, the National Farmers Union, the American Farm Bureau and the National Milk Producers Federation reached out to the USDA requesting the purchase. "This commodity purchase is part of a robust, comprehensive safety net that will help reduce a cheese surplus that is at a 30-year high while, at the same time, moving a high-protein food to the tables of those most in need," said Agriculture Secretary Tom Vilsack in a release. The massive cheese purchase comes more than two weeks after the USDA announced more than $11 million in government assistance to the Dairy Margin Protection Program, which provides a safety net to dairy producers. Last year, the U.S. produced nearly 12 billion pounds of cheese -- an all-time high, according to the USDA. Production has increased 3% in the past year, and 29% in the last decade. Americans are also eating a record amount of cheese at 35 pounds of cheese each year.